FMI pump heads are made from various materials of construction for use in most applications. All FMI pumps are modular in design. The Pump Head Modules can be easily removed for cleaning or replaced with a spare pump head for use with different fluids. Some customers have separate pump heads for use with each fluid handled or flow rate desired. When ordered together, Pump Drive Modules, Pump Head Modules, and options are mounted, tested and shipped as one unit. 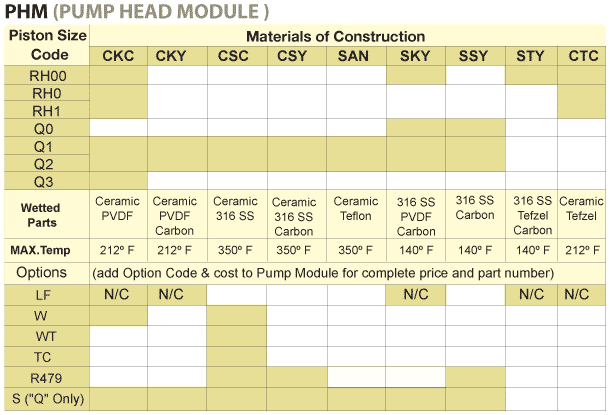 The table below provides codes for all available Pump Head Modules (PHM). After selecting the appropriate Pump Drive Module (PDM) and Piston Size Code, select a PHM and available options below. FMI fluid contact components are fabricated of carefully selected materials. Each one has discrete characteristics of physical strength, abrasion resistance, and dimensional stability under varying conditions of pressure, temperature, and resistance to attack by certain chemicals. Since no one material possesses all of the characteristics required to handle all chemicals under all possible conditions, FMI offers a selection of materials of construction for each pump component that fluids contact during the pumping process. These components and materials are identified on Pump Head Codes & Materials chart below by code designation, common usage names and trade names. Ceramic is used in most of the pumps for piston and/or cylinder liners. Ceramic pistons may be used with ceramic and carbon cylinder liners. Ceramic cylinder liners can only be used with ceramic pistons. Sapphire hard, fused crystalline Ceramic Al2O3, excellent chemical resistance, thermal stability and mechanically resistant to common abrasives. Caution: Subject to binding or freezing when stored after improper cleaning - brittle and subject to fracture under sudden impact loading -not suitable for very 'dry' fluids such as hexane. Fluorocarbon PVDF, is used for some cylinder cases and tubing fittings. Autoclavable @ 240ºF maximum. Good chemical tolerance to most fluids. Caution: Sensitive to degrading effects of some organic solvents, esters, and ketones. Stainless Steel 316 is used for some pistons, cylinder cases and/or tube fittings. Not to be used as piston with ceramic cylinder liner. Excellent chemical, and physical strength characteristics. Caution: Subject to attack by some halides, strong acids, and bases - subject to surface abrasion and wear in piston application. Carbon is used for some cylinder liners. Suitable for use with stainless steel and ceramic pistons. Hard crystalline stage, ingot sintered, pure carbon chemically resistant to most commonly used fluids. Caution: Sensitive to strong oxidants and all abrasive materials. Fluoropolymer E-TFE - Used for cylinder cases in some FMI Pump Head Modules. Excellent chemical resistance to most acids, bases and solvents. Autoclavable @ 240ºF maximum. Fluorocarbon, filled PTFE - Used for lip seals in some FMI pump heads. Excellent chemical resistance, - physically soft, resilient and wear resistant - abrasive to soft metals and should therefore not be used with 'S' pistons in high stroke rate applications. Fluorocarbon, filled PTFE - Used for lip seals in some FMI pump heads. Good chemical resistance, sensitive to some organic solvents, strong acids and bases - physically soft, resilient and non-abrasive. Fluorocarbon PTFE - Used for seals and fittings in some FMI pump head modules - excellent chemical resistance characteristics - soft, pliable, easily cut, nonstick surface chemically stable over wide thermal range, dimensionally sensitive to temperature change -not suitable for structural components. Copyright ⓒ 1994 INJAE SCIENCE CO. All right reserved.